Hyaluronic acid helps moisturise your scalp and hair. Hyaluronic Acid – increases hair growth and makes hair thicker. Soy Proteins – enhance hair manageability, improve the body and texture of hair. Baicapil™ – contains extracts of young bean and wheat sprouts, extracts of Scutellaria baicalensis which is one of the 50 key herbs used in Chinese medicine, and arginine. Test results have shown that most people using this product noticed faster hair growth. Hair loss slows down by 60%. Important to mention that the capillary density increased by 18% on average, resulting in 22,500 more hairs on the head on average. People on average have between 100,000 and 150,000 hairs on their heads. In this Baicapil™ingredient test, participants were 17 men and 44 women between the ages of 18 to 60, the duration of the test was 6 months. 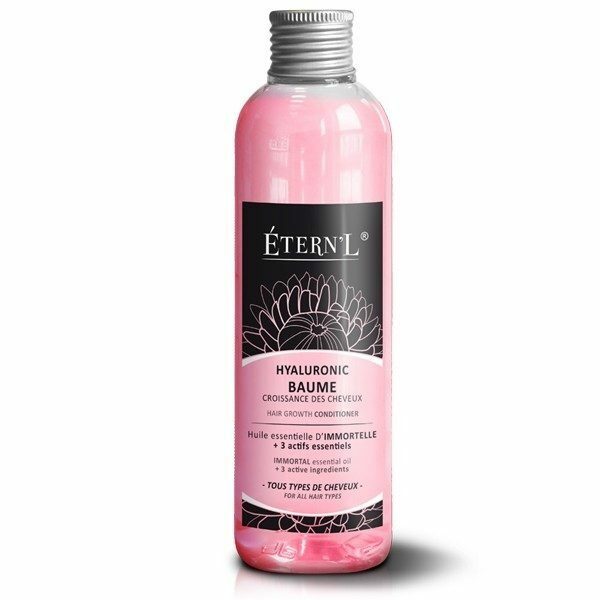 How to use ETERNL Conditioner? After shampooing apply a small amount of conditioner on your entire hair from scalp to tips. Let the conditioner sit for 3 minutes and then rinse with warm water.